Vazirian, M., Mohammadi, M., Farzaei, M., Amin, G., Amanzadeh, Y. (2015). Chemical composition and antioxidant activity of Origanum vulgare subsp. vulgare essential oil from Iran. Research Journal of Pharmacognosy, 2(1), 41-46. M. Vazirian; M. Mohammadi; M.H. Farzaei; G. Amin; Y. Amanzadeh. "Chemical composition and antioxidant activity of Origanum vulgare subsp. vulgare essential oil from Iran". Research Journal of Pharmacognosy, 2, 1, 2015, 41-46. Vazirian, M., Mohammadi, M., Farzaei, M., Amin, G., Amanzadeh, Y. (2015). 'Chemical composition and antioxidant activity of Origanum vulgare subsp. vulgare essential oil from Iran', Research Journal of Pharmacognosy, 2(1), pp. 41-46. Vazirian, M., Mohammadi, M., Farzaei, M., Amin, G., Amanzadeh, Y. Chemical composition and antioxidant activity of Origanum vulgare subsp. vulgare essential oil from Iran. 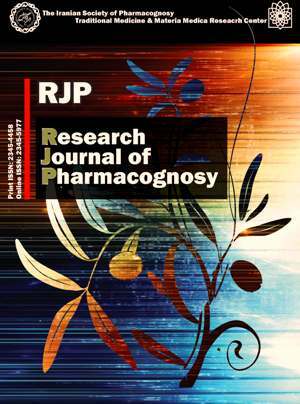 Research Journal of Pharmacognosy, 2015; 2(1): 41-46. 1Department of Pharmacognosy, Faculty of Pharmacy, Tehran University of Medical Sciences, Tehran, Iran. 2Department of Traditional Pharmacy, Faculty of Pharmacy, Tehran University of Medical Sciences, Tehran, Iran. Background and Objectives: Essential oils are very complex mixture of components and their composition may vary in different species or varieties or even within the same variety. Origanum vulgare L. subsp. vulgare is one of the most distributed subspecies within the genus Origanum and has been found to be a poor-oil, categorized in cymyl, bornane or sabinyl chemotypes with higher proportion of sesquiterpenes. In this experiment, the Iranian sample was studied for the chemical composition of the oil and evaluation of its antioxidant activity. Methods: Essential oil was obtained by hydro-distillation and analyzed by GC/MS for determination of components. Antioxidant activity was evaluated by radical scavenging ability (DPPH method) and reducing power (FRAP assay). Results: The sample belonged to “thymol” chemotype with the main components as thymol (37.13%), gama-terpinene (9.67%), carvacrol (9.57%), carvacrol methyl ether (6.88), cis-alpha-bisabolene (6.80%), eucalyptol (3.82%), p-cymene (3.58%) and elemol (2.04%). The oil of plant showed very strong antioxidant activity (IC50=2.5 µg/mL in DPPH method), which was stronger than the standard antioxidants (Vit E and BHA, p<0.05) and it demonstrated good reducing power (467.25 μmole Eq FeSO4.7H2O/mg of the oil in FRAP assay). Conclusion: The data suggests the plant as a good potential natural antioxidant preservative. Stefanakis MK, Touloupakis E, Anastasopoulos E, Ghanotakis D, Katerinopoulos HE, Makridis P. Antibacterial activity of essential oils from plants of the genus Origanum. Food Control. 2013; 34: 539-546. Sahin F, Gulluce M, Daferera D, Sokmen A, Sokmen M, Polissiou M, Ozer H. Biological activities of the essential oils and methanol extract of Origanum vulgare ssp. vulgare in the Eastern Anatolia region of Turkey. Food Control. 2004; 15: 549-557. Vokou D, Kokkini S, Bessiere JM. Geographic variation of greek oregano (Origanum vulgare ssp. hirtum) essential oils. Biochem Syst Ecol. 1993; 21: 287-295. Kokkini S, Karousou R, Vokou D. Pattern of geographic variation of Origanum vulgare trichomes and essential oil content in Greece. Biochem Syst Ecol. 1994; 22: 517-528. Napoli EM, Curcuruto G, Ruberto G. Screening the essential oil composition of wild Sicilian oregano. Biochem Syst Ecol. 2009; 37: 484-493. Bisht D, Chanotiya CS, Rana M, Manoj S. Variability in essential oil and bioactive chiral monoterpenoid compositions of Indian oregano (Origanum vulgare L.) populations from northwestern Himalaya and their chemotaxonomy. Ind Crop Prod. 2009; 30: 422-426. Brigitte L, Schmiderer C, Johannes N. Phytochemical diversity of Origanum vulgare L. subsp. vulgare (Lamiaceae) from Austria. Biochem Syst Ecol. 2013; 50: 106-113. Mombeyni T, Mombeyni M, Aghaei M. Evaluation of pharmacological effects of Origanum genus (Origanum spp). J Med Plants. 2008; 29: 18-35. Licina BZ, Stefanovic OD, Vasic SM, Radojevic ID, Dekic MS, Comic LR. Biological activities of the extracts from wild growing Origanum vulgare L. Food Control. 2013; 33: 498-504. Srihari T, Sengottuvelan M, Nalini N. Dose-dependent effect of oregano (Origanum vulgare L.) on lipid peroxidation and antioxidant status in 1,2-dimethylhydrazine-induced rat colon carcinogenesis. J Pharm Pharmacol. 2008; 60: 787-794. Castilho PC, Savluchinske-Feio S, Weinhold TS, Gouveia SC. Evaluation of the antimicrobial and antioxidant activities of essential oils, extracts and their main components from oregano from Madeira Island, Portugal. Food Control. 2012; 23: 552-558. Souza EL, Stamford TL, Lima EO, Trajan VN. Effectiveness of Origanum vulgare L. essential oil to inhibit the growth of food spoiling yeasts. Food Control. 2007; 18: 409-413. Nostro A, Blanco AR, Cannatelli MA, Enea V, Flamini G, Morelli I, Alonzo V. Susceptibility of methicillin-resistant staphylococci to oregano essential oil, carvacrol and thymol. Fems Microbiol Lett. 2004; 230: 191-195. Botsoglou NA, Christaki E, Fletouris DJ, Florou-Paneri P, Spais AB. The effect of dietary oregano essential oil on lipid oxidation in raw and cooked chicken during refrigerated storage. Meat Sci. 2002; 62: 259-265. Botsoglou NA, Grigoropoulou SH, Botsoglou E, Govaris A, Papageorgiou G. The effects of dietary oregano essential oil and α-tocopheryl acetate on lipid oxidation in raw and cooked turkey during refrigerated storage. Meat Sci. 2003; 65: 1193-1200. Simitzis PE, Symeon GK, Charismiadou MA, Bizelis JA, Deligeorgis SG. The effects of dietary oregano oil supplementation on pig meat characteristics. Meat Sci. 2010;84: 670-676. Kulisic T, Radonic A, Katalinic V, Milos M. Use of different methods for testing antioxidative activity of oregano essential oil. Food Chem. 2004; 85: 633-640. Mirzaee A, Jaberi-Hafashani H, Madani A. Antioxidant activities, total phenols and total flavonoids assay of Origanurm vulgare, Teucrium polium and Thymus daensis. Med J Hormozgan. 2011; 4: 285-294. Abbasnejad M, Mirtajadini M, Afarinesh M, Hassibi N. Valuation of Origanum vulgare (leaves, stems and flowers) extract on spatial learning in male rats. Physiol Pharmacol. 2006;10: 143-150. Misharina TA, Burlakova EB, Fatkullina LD, Alinkina ES, Vorob’eva AK, Medvedeva IB, Kozachenko AI. Effect of oregano esential oil on the engraftment and development of Lewis carcinoma in F1 DBA C57 black hybrid mice. Appl Biochem Micro. 2013; 49: 432-436. Baranauskiene R, Venskutonis PR, Dambrauskiene E. Harvesting time influences the yield and oil composition of Origanum vulgare L. ssp. vulgare and ssp. hirtum. Ind Crop Prod. 2013; 49: 43-51. Mockute D, Bernotiene G, Judzentiene A. The essential oil of Origanum vulgare subsp. vulgare growing wild in Vilnius district (Lithuania). Phytochemistry. 2001; 57: 65-69. Adams RP. Identification of essential oil components by Gas chromatography/Mass spectrometry. Carol Stream IL: Allured Publishing Corporation, 2007. Ebrahimabadi AH, Mazoochi A, Jookar Kashi F, Djafari-Bidgoli Z, Batooli H. Essential oil composition and antioxidant and antimicrobial properties of the aerial parts of Salvia eremophila Boiss. from Iran. Food Chem Toxicol. 2010; 48: 1371-1376. Boudiaf K, Houcher Z, Sobhi W, Benboubetra M. Evaluation of antioxidant and anti-xanthine oxidoreductase activities of Nigella sativa Linn. seeds’ extracts. J Appl Biol Sci. 2010; 4: 7-16. Mockute D, Bernotiene G, Judzentiene A. The beta-ocimene chemotype of essential oils of the inflorescences and the leaves with stems from Origanum vulgare ssp. vulgare growing wild in Lithuania. Biochem Syst Ecol. 2003; 31: 269-278. D'antuono LF, Galletti GC, Bocchini P. Variability of essential oil content and composition of Origanum vulgare L. populations from a North Mediterranean area (Liguria Region, Northern Italy). Ann Bot-London. 2000; 86: 471-478. Scherer R, Godoy HT. Antioxidant activity index (AAI) by the 2,2-diphenyl-1-picrylhydrazyl method. Food Chem. 2009; 112: 654-658.